MAJDAL SHAMS: An election poster at the entrance to Majdal Shams in the Israeli-occupied Golan Heights offers a rare reminder that the Druze community is about to vote for the first time in more than 50 years. As across Israel, the residents of this mountainous region will have the chance to cast their ballots on Tuesday for their local councils. But for the Druze of the Golan plateau these elections are different — and far more controversial. 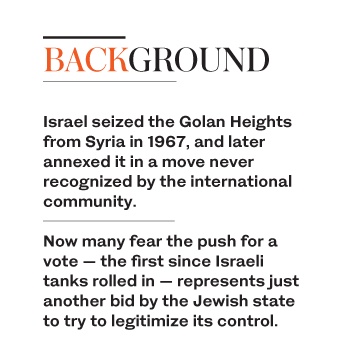 Israel seized the strategic region from Syria in 1967, and later annexed it in a move never recognized by the international community. Now many fear the push for a vote — the first since Israeli tanks rolled in — represents just another bid by the Jewish state to try to legitimize its control. Such is the discontent that there has been a campaign to boycott the poll and a string of candidates have pulled out. Dolan Abu Saleh, 40, is still in the race. But he is not holding any public meetings or events and has to content himself with meeting a few voters in his offices. “It is very sensitive,” he said. Saleh, who is close to the Likud party of Israeli Prime Minister Benjamin Netanyahu, recognizes that calls for a boycott will likely keep most people from casting their ballots. But he insists that for the Druze living in occupied Golan this vote is a good opportunity to make their voices heard. Before now Saleh served two terms as mayor of Majdal Shams, elected both times by local council members who were themselves appointed by Israel’s Interior Ministry. “Between being appointed and being elected, there is no doubt that an election is more democratic,” he said. The majority of the 23,000 Druze in the occupied Golan have never opted to become Israeli citizens, according to Saleh. But most are “permanent residents” of the Jewish state who are allowed to vote in the election, while only those who got citizenship can run for office. This vote is taking place after a group of Druze lawyers petitioned Israel’s Supreme Court for the right to hold it so they can elect a mayor who will improve services for their community. But the influential religious leadership has campaigned against them and, although there is little sign of enthusiasm, the community usually abides by their decisions. In the village of Buqata, residents shut their front doors or shrug their shoulders when questions are asked about the election. “We are not taking part,” says an elderly woman dressed traditionally in black with a white veil. Amal Abu Shahin, 47, points at a Syrian flag painted on the wall behind him as he makes his point. But the war in Syria has changed the relationship between many in the community and their one-time homeland. Where once Druze from the region dreamt of going to study or work in Syria, now the seven-year conflict has seen more and more youths turn their hopes toward Israel out of pragmatism. “I’m for the elections, we’re with Israel now, Syria is over!,” says a 24-year-old man, who refuses to give his name. But despite that he will not cast a ballot. “There are people who will check who will vote or not,” he explains. Political activist Sameh Samara says he can’t understand the calls to boycott the vote. Sitting in his house he insists it could help bring better services and rejects the claim it will bolster Israeli claims of sovereignty. It is better “to choose the right person, a child of this earth, rather than have someone imposed on us who is not suitable and not from here,” he says. But from his balcony overlooking Majdal Shams and the disputed frontier 500 meters away, rights activist Wael Tarabieh holds a different opinion. Across the divide that snakes through the mountains lies Syria, where almost everyone here has relatives still living. And for him the election is just an attempt to further cement decades of unlawful occupation. “It is a way to get recognition for the fundamentally illegal presence of Israel,” he says.